In the 1926 World Series Babe Ruth heard about 11-year-old Johnny Sylvester, a New York boy who had been hurt in an accident and was in the hospital desperately ill. 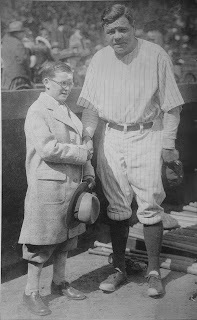 The Babe rushed to the hospital to visit Sylvester and promised to hit a home run on his behalf. The next day the Sultan of Swat hit not one but three home runs for the youngster. Sylvester rallied, went to Princeton, served in World War II, had a successful business career, and died in 1990 at the age of 74, a lifelong Yankee fan. (That's Johnny and the Babe at the left). Good causes, it seems to the founders of New York City-based company Charity Bets, can be a terrific performance enhancers. Now Charity Bets is betting that people are willing to wager their athleticism against their friends' scepticism! Here’s how it works: You set a performance goal for a race event; triathlon, marathon, bike race, 10K, etc. Then you solicit pledges from your network of friends that you’re willing to bet them that you’ll hit some performance measure; finish in the top three, say. Charity Bets calls that a progressive donation. After you certify the results, Charity Bets duns the people who made a pledge and pays the charity. They currently work with more than 50 charities. Charity Bets also takes over/under donations, and rep-based donations. A rep-based donation is based on the number of reps you do; say bench presses. An over/under donation pays more if you achieve some high mark. For instance, an over/under donation might generate $100 if you break the 3-hour mark in a marathon but only $5 if you run it in more than 3 hours. In a sense, this is a more democratized version of one those promotions your local pro sports team does whereby a local sponsor offers $50 to the children’s hospital for every three-pointer hit during the season. Or $100 to the Ronald McDonald House for every touchdown scored during a game after the first 30 points. Except that it’s hard to imagine that when Tom Brady is slinging touchdown passes that he cares whether or not the local State Farm Insurance agents group has to pony up a few hundred extra bucks to the Jimmy Fund. But if you’re running along in a marathon and you hit the wall, the knowledge that if you can beat your performance goal that your buddies will have to pay a steeper price to your favorite charity might just be enough to help you power through. Performance incentives really do work. Tom Brady almost certainly has performance incentives of his own: games won; number of touchdown passes versus interceptions; fourth-quarter comebacks; number of times he and his wife model Gisele Bundchen show up in GQ magazine; etc. One thing glaringly missing from Charity Bets is an easy way to contact and solicit your network. You could cobble together something with Crowdrise, the focus of yesterday’s post. But Charity Bets’ business model would be greatly enhanced by the addition of social networking platform.